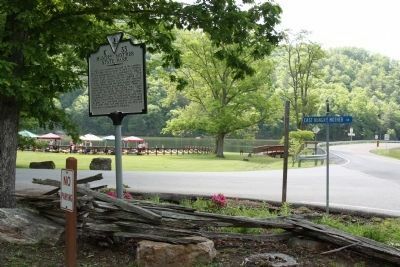 In 1933 local residents assisted in the creation and donated 2,000 acres of land to Virginia for the establishment of a state park in Smyth County along Hungry Mother Creek. The unusual name comes from the legend of a nearby Indian settler conflict that resulted in Molly Marley and her child being captured. They later escaped but Marley died. 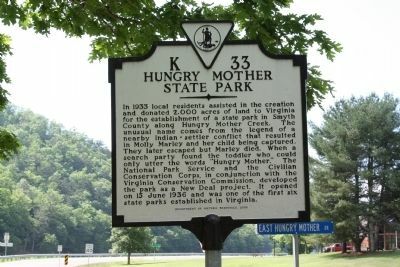 When a search party found the toddler who could only utter the words “Hungry Mother.” The National Park Service and the Civilian Conservation Corps, in conjunction with the Virginia Conservation Commission, developed the park as a New Deal project. It opened on 15 June 1936 and was one of the first six state parks established in Virginia. The sandy beach on the man-made lake can be seen in the distance on the left. (Virginia Route 16) and East Hungry Mother Drive (Virginia Route 348), on the right when traveling north on B. F. Buchanan Highway. Touch for map. It is at the main entrance to the park. Marker is in this post office area: Marion VA 24354, United States of America. Touch for directions. Other nearby markers. At least 8 other markers are within 4 miles of this marker, measured as the crow flies. Col. Arthur Campbell (approx. 3.1 miles away); Site of Colonial Home (approx. 3.1 miles away); Engagement at Marion (approx. 3.2 miles away); Battle of Marion (approx. 3.2 miles away); Sherwood Anderson (approx. 3.2 miles away); Royal Oak Presbyterian Church (approx. 3.2 miles away); Col. William Elisha Peters (approx. 3.4 miles away); Confederate Memorial (approx. 3½ miles away). Touch for a list and map of all markers in Marion. More. Search the internet for Hungry Mother State Park. Credits. This page was last revised on June 16, 2016. This page originally submitted on July 24, 2011, by J. J. Prats of Powell, Ohio. This page has been viewed 632 times since then and 9 times this year. Photos: 1, 2. submitted on July 24, 2011, by J. J. Prats of Powell, Ohio. Editor’s want-list for this marker. Photos of the park • Can you help?